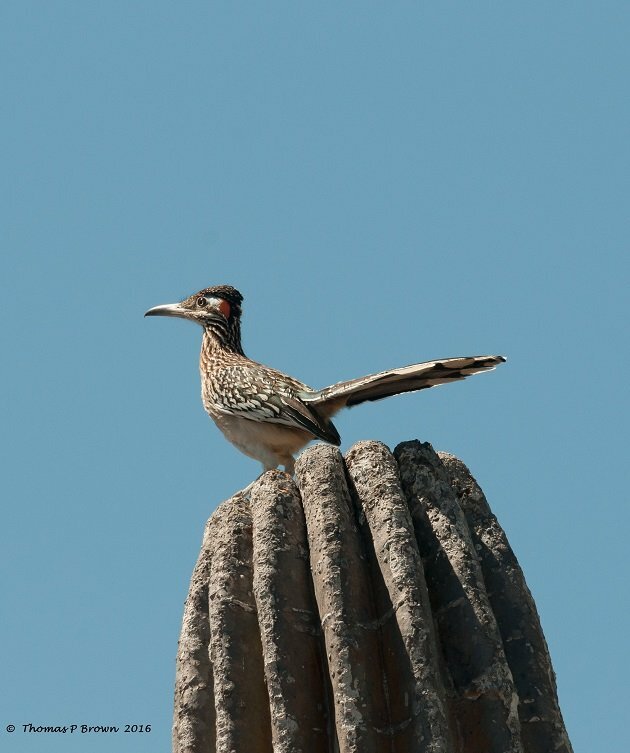 The Greater Roadrunner, Geococcyx, californianus, an iconic bird that is the symbol of many Native American, and Mexican legends. This speedy ground dwelling birds namesake has been used for a popular American car model, and without question, one of the all time great Sunday morning cartoons that we all grew up with. Hardly a brochure from the Southwest US or Mexico is published without the Roadrunners image on it. The Greater Roadrunner, a member of the cuckoo family, is native to much of the Southwestern United States, and northern Mexico. 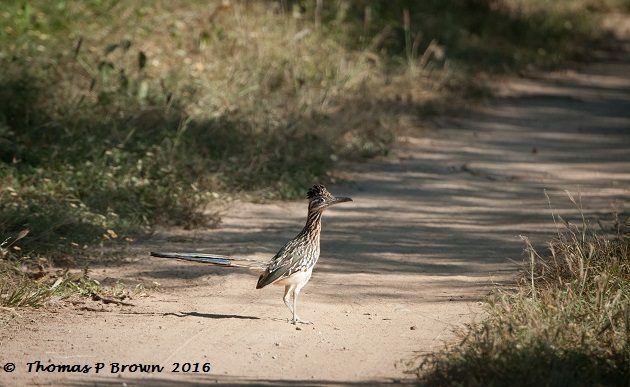 There is a close relative, the Lesser Roadrunner, Geococcy velox, found in a small area of eastern central Mexico. It is very similar in appearance, slightly smaller in overall size, with a shorter bill. 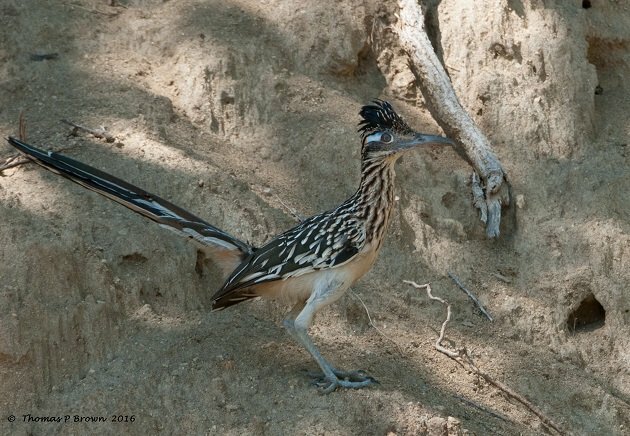 The primary food source for the roadrunner is insects, lizards, and small snakes, which it gets ahold of and bashes on a rock until dead. They are quite capable of killing and eating the venomous rattlesnakes of this desert region. While this bird is know for its ability to run at some very high speeds, consistently up to 20 MPH, it is an excellent flyer. 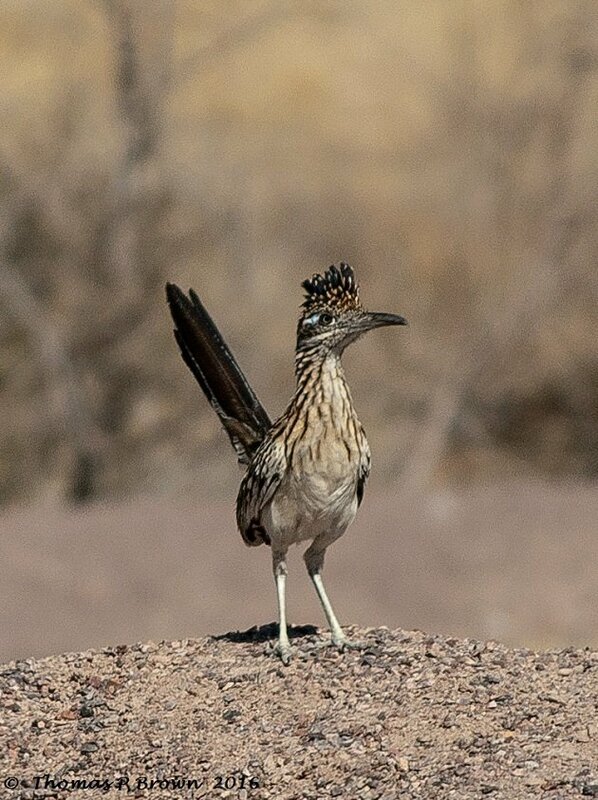 Several times I have seen roadrunners fly well over 100 yards from a ridge top to the desert floor. It is also common to see them perched on a tall cactus, keeping a look out for that next meal. So, be honest, how many of you saw this story, or series of photos, and somewhere in the back of your head, just had a little “Beep-beep” sneak out? Thank you ACME and Wiley E. Coyote for keeping this great bird as popular as it is! 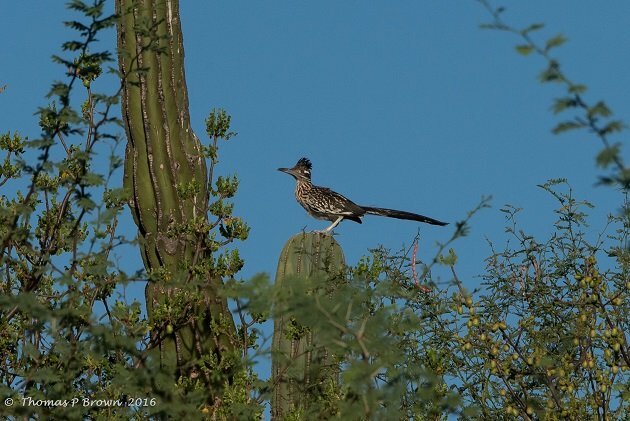 My first roadrunner came after tramping the desert near Tucson for over 6 hours without success. The bird showed well however at the drive-through window of a nearby burger outlet and looked up at the server as if expecting scraps. Not my best lifer experience.